I know in my last post I said we were moving to Italy. Well, I was just kidding. Why aren’t you moving to Italy, you ask? Well, because I’m committed to trying everything on the Vinnie’s menu and also working my way through the restaurants in downtown Wheaton. Downtown Wheaton rules. I’m not one of those city-dwellers that makes fun of the burbs. I have no tolerance for idiots that say things like “oh, I never go to the suburbs unless it’s to see friends or win a bar fight.” I embrace the burbs and constantly seek quality downtown experiences all around Chicagoland. And let me tell you, Wheaton is one of those special downtowns and home to Suzette’s Creperie, at 211 West Front Street. Suzette’s is a French dining experience that would impress any Francophile. This is a picture of my fine entree. It’s called the Spicy Coconut Shrimp Crepe ($13). 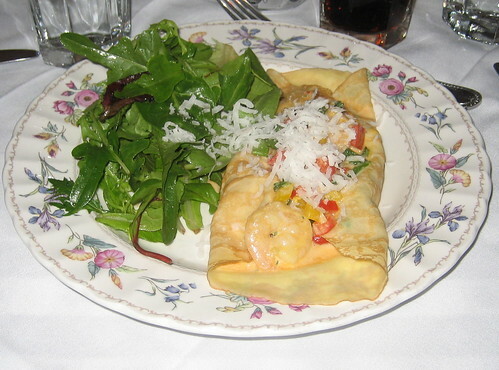 It’s a crepe with shrimp, red, yellow, and poblano peppers, garlic, cream, then topped with coconut and lime. It’s served with a side of salad and the house vinaigrette. A little pricey you ask? Yes. It’s not a lot of food for $13 but that’s why the French aren’t fat I guess. It was really good though, so I felt the price was justified. Plus, it was a special day out for my wife and mother-in-law. I surprised them with this place and they loved it. I am probably the top husband/son-in-law on the face of the earth. They really have a diverse menu. As you would expect, there are a bunch of French standards like traditional French onion soup and a croque monsieur sandwich. But they also have things like crab cakes with habanero lime sauce and the crepe I had above. We went at lunch and it was packed by 12:15, so call ahead and make a reservation. I have a feeling that dinner is just as crowded. Posted in food on 2007/03/20 by John.